AFLW Round 2 – Fremantle v Brisbane: Home and away. Pre-match. I’m nervous. I head to my mate’s place on the 17th floor of Melbourne CBD units to watch the Dockers first home game in the heart of Fremantle. Fremantle Oval is the latest of the suburban grounds to be filled to capacity – around 10 000 – in just the eighth game of the AFL Women’s competition. Fremantle Oval is very, well, Freo. The streets closest lead you to the local markets, hospital, beach or prison. If I can’t be at the game, this is where I want to be. Large screen, good mates and pizza. I’m nervous, so I decide to take notes. I’m nervous because our defender, Ebony Antonio, was suspended last week and I think Freo could struggle with the Brisbane talls, Sabrina Frederick-Traub and Tayla Harris. I’m nervous because the oval is wide and as hard as the seats in the old grandstand. The opening to the game is tight. After three minutes I’m yelling at the TV for the crowd to get involved – they seem so quiet. Maybe it’s me that’s too loud? Hayley Miller (Fremantle) collects a misfired Kim Mickle kick in the forward 50 but hits the post. There is plenty of congested play. The Brisbane Lions keep pushing forward and score through Jessica Wuetschner. Both sides make promising moves in to their forward 50s but goals are scarce. Gabby O’Sullivan shows her skills close to the boundary. This is the first time my mate has paid close attention to the AFLW and as I attempt to introduce him to the players, I wish I had brought along my copy of A Girls Guide to the Stars of 2017. It’s written for the 7 to 12-year-old reader but hey, aren’t we all novices? I urge the players to keep pushing. The ball is close to the Fremantle goal line. It feels like the Dockers are surging for the try with the Lions pack holding ground. I don’t even watch rugby! O’Sullivan draws a fifty metre penalty and converts from close range. 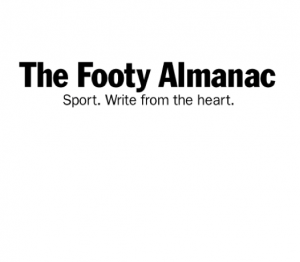 Quarter time scores – Fremantle 1.1. (7) Brisbane 1.2. (8). The opening to the second quarter is tight. Brisbane keep moving forward, great play on the wing. Miller and Brisbane Marquee Forward (she deserves capital letters) Tayla Harris, playing in defence, contest a mark on the wing. Lara Filocamo (Fremantle) fights on but Brisbane are dominating. Emily Bates (Bribsane) and Frederick-Traub (she has her own capitals) miss shots on goal and the Lions keep pushing. Fremantle’s Tayla Bresland’s tackle in the forward 50 leads to a 50 metre penalty against her defender. It keeps the margin tight. Stephanie Cain, Stacey Barr and Kara Donnellan fight hard across the ground and when Stacey Barr kicks Fremantle’s third I exhale for a moment. Sabrina Frederick-Traub snaps a goal in general play with four minutes left in the half. SFT is the other BMF and Freo’s home crowd is her old home crowd. The Lion is competing strongly in the ruck and hurting the locals on the scoreboard. Harris takes another strong mark and kicks from 30 metres out with the wind behind her. Another goal to the visitors close to the break and they take the lead. Half time scores – Fremantle 3.1. (19) Brisbane 3.3. (21). At half time, my mate (my partner and I call him the third in the House of the Heave Hoes) shares Lady Gaga’s Super Bowl Half Time Show and more pizza. I’m still nervous and GaGa is suitable distraction. But I have noticed Kim Mickle and Breanna Green are injured for the home team. The last quarter begins with repeated behinds to the Dockers. Skipper Kara Donnellan plays on from around about the 50 metre arc, attempts a double dummy dishes off to a team mate for a shot on goal and another forward surge is un-rewarded. I’m feeling the tension and hoping the players are not. The Brisbane Lions have defended well again and again and hold the lead with two minutes to go. Six points the difference. A goal from Fremantle will tie it up. Can the Dockers salvage a draw? With barely a minute left in the game, there is another scrambled kick to a crowded Lions forward line. BMF Taylah Harris soars for sensational pack mark and kicks truly. The Lions have won by 13 points; it is the second game the club has played in the AFLW and they are yet to play at home. Hard fought defence across the ground, goals when it mattered. What a win away! The yet-to-lose Lions join Crows and the Blues at the top of the table and take on Collingwood next week. Fremantle head to Blacktown to take on one of the other yet-to-win teams, hoping to be Giant(s) killers next Saturday. Brisbane: Harris, Frederick-Traub, Hunt, Zielke, Virgo. Well done Danae, summed the game up well. It seems all the missed opportunities, the inaccuracies, are killing the losing teams. In such a short game of footy, these moments really matter. I watched this game from my comfy chair too and it was great having the explanations and names of players, as we get to know a whole lot of amazing teams. Tayla Harris was unbelievable. thanks Yvette, what a great weekend of footy!